Does your Simplicity lawn or garden tractor need a new head light or light bulb? You've come to the right place. Jack's has replacement headlights and bulbs to help you shine light back on your lawn at night. 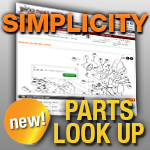 Select the headlight parts you need below for your Simplicity lawn mower.